Home > Exient Articles > Who’s your favourite? Its hard for one to properly appreciate the mass appeal of both Angry Birds and Star Wars, to combine two huge brands like this is really interesting and when the ‘Exient Imagineers Team’ were tasked with bringing Rovios’ game to consoles they had a chance to really soak up the characters and iconic factions from the epic story. 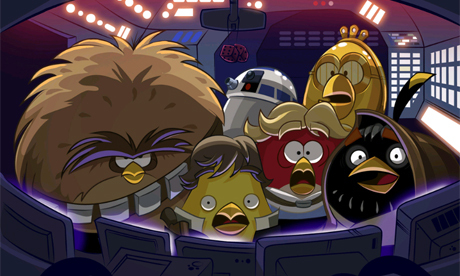 We asked our team who their most favourite character is in Angry Birds Star Wars. Thomas Bartsoek said his favourite was Luke, “because he pulls really funny expressions when he hits something” and Thomas prefers the good guys to the baddies (always). Why not tells us who your favourite characters are in the epic retelling of rebel bird and imperial ‘pork-side’? Speculative Application Note Interested in our current open vacancies? Take a look in our Careers section. There you will find our current openings, or can click on "That's Not All" to submit a Speculative Application. Game Feedback Note To leave feedback for one of our games, click on the SEND GAME FEEDBACK tab above.